One of the things I personally enjoy about 5e is how much room is left for creativity. Below is information on a rogue archetype called The Conman. The Conman is for use in places with large populations. 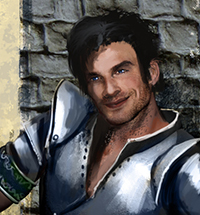 The Conman may not gain some of the combat bonuses other rogue archetypes do, but this character is incredibly useful in urban environments. You focus your social skills to a point where you use them for personal gain. You live for the thrill of setting up and executing a well planned operation. Not all who live for the con use their skills to enrich themselves. Some do so to enact a sense of vengeance against a world that they see as unfair. Still others have taken the concept of attracting flies with honey instead of vinegar to heart. While Dexterity and it’s associated skills are important to you, you have found that Charisma is your primary tool. Some people might think you’re a lair and cheat, but you know deep down inside, everyone is. When you take this archetype at third level you make all Charisma (Deception) and Charisma (Persuasion) checks at advantage. You can also use the bonus action from cunning action to re-roll a failed check but must take disadvantage when you do. When a con goes south, running away is the better part of valor. At fifth level you can attempt actions that hinder an enemies attempt to chase you. Anytime an enemy grows close enough to attack they must first succeed in a Strength (Athletics) roll. A failure indicates they lose a round of action while you continue running. You have learned to disguise yourself very well and can change your appearance quickly. At 9th level you may make a Charisma (Performance) check to disguise yourself. To do this you must be hidden and have proper clothing for the disguise. The action takes 1d6 rounds. If you choose to spend a full six rounds creating the disguise the Charisma (Performance) roll is with advantage. When you reach 13th level, you have spent time building up a secret life that allows you to be anyone you want to be. To build a secret life you must purchase a home. You also must spend at least one month living as this person. Once a secret life is established, you can use it at any time You can build as many secret lives as you wish. At 17th level you gain the loyalty of a fellow conman. This character is 3rd level and may by used in any way you see fit. This character will gain experience and develop skills as you choose.